MARKING ELISABETH RATIU�S 90th BIRTHDAY Hosted by Dr Mike Phillips OBE, British novelist, historian and curator Followed by a Q&A session Thursday 5 May 2011, 19.00-21.00, The Ratiu Foundation / Romanian Cultural Centre Manchester Square, 18 Fitzhardinge Street, London W1H 6EQ; Tel. 020 7486 0295, ext 108 e-mail: bookings@romanianculturalcentre.org.uk; Entry is free but booking is essential. EXHIBITION DEDICATED TO ELISABETH RATIU In The Ratiu Foundation Building. Opening times: Mon - Fri 12.00 - 18.00. Admission free (booking essential, by phone or e-mail at bookings@romanianculturalcentre.org.uk) Elisabeth Ratiu, co-founder and trustee of the Ratiu Foundation, has recently celebrated her 90th birthday in the midst of her close family and friends. 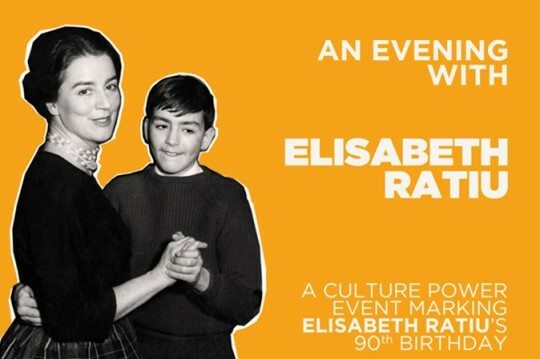 As a token of appreciation for Elisabeth�s life-long support of Romanian culture and society, the Ratiu Foundation / Romanian Cultural Centre in London is organising a special Culture Power event to celebrate Elisabeth�s life and work. The images in the exhibition dedicated to Elisabeth Ratiu come from the Ratiu Archives and the personal collections of the Ratiu family, and are presented to the public for the first time. On the evening of Thursday 5 May, Elisabeth will be in an open discussion with Dr Mike Phillips OBE, convenor of the Culture Power series. The discussion will touch on various subjects: from personal recollections of her early life to the establishment of Romanian cultural associations in the 1960s, the Ratiu Foundation in 1979, and the World Union of Free Romanians in 1984, as well as her first contact with Romania in early 1990, after the revolution put an end to the family�s exile. We are looking forward to seeing you at the discussion and private view of the exhibition. An informal drinks reception will follow. // // // // // // // // // // // // We can safely assume that before meeting Ion Ratiu in Cambridge, Elisabeth Pilkington, a young LSE student whose classes had been moved there because of the war, had no specific interest in Romania. All this was to change shortly thereafter, as the young English girl married Ion in 1945. �I was a very romantic girl and I wanted to have an interesting life, and I wanted to have an interesting life with an interesting man. I fell in love with a man who fulfilled my dreams, and in a way, Ion did fulfil dreams which I hadn�t dreamt of. I was never ever bored with him� � declared Elisabeth in 2000, for a documentary film charting Ion Ratiu�s life. During 55 years of marriage, Elisabeth was not content only with observing the life of the Romanian exile. She decided to immerse herself in this life and in the culture and customs of these people for whom there was no greater goal than seeing Romania free again. In between raising Indrei and Nicolae, her two children, doing charity work and working in the sales department of Harrods, as well as mixing entrepreneurship and cookery, Elisabeth also found the time to support Ion Ratiu in his efforts to bring together Romanian exiles in a cohesive community and an organisation that could oppose the communist dictatorship. // // // // // // // // // // // // Dr Mike Phillips OBE is a novelist, historian and curator, consultant to various cultural organisations across Europe. Organised by The Ratiu Foundation / Romanian Cultural Centre in London. Culture Power is a programme initiated by the Ratiu Foundation, consisting of a number of presentations and constructive dialogue with an invited audience. With the support of Profusion International Creative Consultancy. Note: Image above shows Elisabeth Ratiu dancing with her son, Nicolae, early 1960s. Image from the Ratiu Archive � Ratiu Foundation.